Germany-based Dreyplas has been appointed the distributor by Chinese company, Jilin Zhong Yan High Performance Plastic (Zhong Yan) to distribute its PEEK material in Europe. The Chinese raw material manufacturer has a capacity of 1,000 tonnes/year. The range covers PEEK powder and granules with high, medium and low viscosity as well as glass and carbon fibre-reinforced PEEK materials in standard grades for direct processing and compounding. The material from Zhong Yan is noted for its relatively light inherent colour and consistently high quality. On completion of the current start up phase in Europe, Dreyplas will be able to supply its customers quickly and flexibly from the company's European central warehouse. The new PEEK grades will be a useful supplement to the distributor's present portfolio, which consists predominantly of raw materials from Asian suppliers for compounding. They include additives to improve the tribological properties such as special PTFE micro powders as well as application-specific carbon fibre sizes, flame retardants and high performance plastics such as LCP. 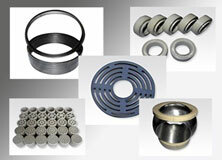 The Zhong Yan PEEK materials have high temperature resistance and offer similar corrosion resistance to nickel-steel. Without flame retardants, they can achieve very high flame retardance ratings with good self-extinguishing properties. Because of their high purity, outgassing is low, minimising the impact on the environment. Their very good dielectric properties remain largely constant over a wide frequency and temperature range. Thanks to their high hydrolysis resistance, the mechanical properties are retained even after long-term exposure to moisture under high pressures and temperatures. Typical fields of application include components used in the aerospace industry as a substitute for aluminium and other metals, automotive parts for the engine compartment, insulating components in the electrical and electronics segment, and corrosion-resistant parts for chemical apparatus and systems in the food industry. Zhongyan High Performance Plastics is a raw materials producer specialised in the development and production of high-performance plastics such as PI and PEEK. Since 2007, the company has been operating a modern industrial park with an area of 30,000 sq m in the Province of Jilin. With a current capacity of 1,000 tonnes/year the main activity there is the production of standard and customised unreinforced and compounded PEEK.